Combined Heat And Power Market size for 2016 was valued over USD 20 billion, with annual installed capacity to exceed 25 GW by 2024. Shifting trends from conventional to sustainable energy along with growing demand for captive power generation will positively drive the combined heat and power market size. In 2017, the Government of China cancelled over 100 upcoming coal fired power plants with an estimated capacity of 120 GW. Energy security, increasing carbon footprint and growing penetration of renewable energy may encourage the product adoption in coming years. Low operating costs, higher efficiency and declining natural gas price are some of the key parameters which will propel the CHP market share. According to the International Energy Agency, coal-fired power plants operate at 36% efficiency, while CHP operate at 58%. Growing demand for decentralized power generation will further complement the business landscape. Favorable government initiatives including tax rebates, feed in tariff (FIT), financial assistance will fuel the combined heat and power market share. The U.S. Government aims to install over 40,000 MW of CHP plants by 2020. Stringent norms to reduce greenhouse gas (GHG) emissions coupled with growing demand for clean fuel energy will augment the industry growth. As per European Commission, increased number of CHP facilities could lower GHG emissions in EU countries by 250 million metric tons by 2020. Natural gas combined heat and power market is predicted to witness growth over 10% owing to its affordable price and low emission rate. As per, the U.S. Department of Energy, share of natural gas production may expand to 56% by 2040 from 2012 level. Growing concern to maintain fossil fuel sustainability will further complement the industry growth. Limited land availability for incinerators and landfills along with increasing consumer awareness towards waste management will further stimulate the biomass CHP market. Introduction of government initiatives to promote use of renewable heat will further augment the business landscape. High energy efficiency coupled with low fuel consumption will foster the gas turbine combined heat and power market share. Replacement of existing coal fired power stations with modern gas-fired systems to reduce carbon footprint will positively influence the industry landscape. In 2017, two coal-fired units of Appalachian Power's Clinch River Power Plant in U.S. were converted to natural gas. Reciprocating engine CHP market for 2016 was over 500 MW. Ability to seal gap between cylinder and piston, high heat efficiency, high compression ratio, and low fuel consumption make its adoption favorable over other available alternatives. It finds wide applications in industrial and commercial facilities. Industrial combined heat and power market size is set to exceed USD 20 billion by 2024. Growing development of small scale industrial sector coupled with high electricity demand will positively influence the business growth. In the U.S, BGE Smart Energy Savers Program provide incentives of up to USD 2.5 million to commercial and industrial customers installing on-site CHP systems. Increasing demand for reliable and cost effective technologies along with measures towards carbon footprints will propel the commercial CHP market. The Government of UK introduced Renewable Heat Incentive program based on annual meter reading of commercial building to provide financial support to renewable heat generation. In 2014, CHP accounted for 36% of the Finland electricity generation owing to its extreme cold climatic conditions. Global combined heat and power market for 2016 from 1 kW – 500 kW was valued over USD 5 billion. Increasing demand for reliable and continuous power supply from residential sector will positively impact the industry outlook. The cogeneration unit can replace central heating furnace and provide hot water catering to majority of the residential electricity needs. Rapid industrialization along with government initiatives to promote clean energy will foster the CHP market. Expansion and upgradation of existing conventional plant will boost the demand for large capacity (above 5 MW) CHP systems. In September 2016, Germany inaugurated 453 MW Koln Niehl III CHP unit which help to cut 500,000t of CO2 emissions annually. Low natural gas prices with growing demand for high efficiency power plants will fuel the U.S. combined heat and power market. Retrofitting and replacement of existing power stations with efficient systems may further boost the product demand. In 2014, Capstone Turbine installed 470 CHP systems in the country, with an aim to reduce carbon footprint. Germany combined heat and power market is set to exceed 3 GW by 2024. Increasing demand for district heating system from residential and commercial sector will stimulate the business growth. The Government of Germany introduced KWKG 2016 CHP Act to support the expansion and construction of energy efficient district heating networks. Rapid industrialization and urbanization coupled with growing demand for clean fuel energy will propel the China CHP market. Stringent norms to reduce the carbon emissions coupled with growing demand for decentralize power generation will augment the industry size. The Government of China in its 13th Five-Year Plan aimed to focus towards adoption of gas-fired CHP plants and replacement of existing coal fired power generating units. 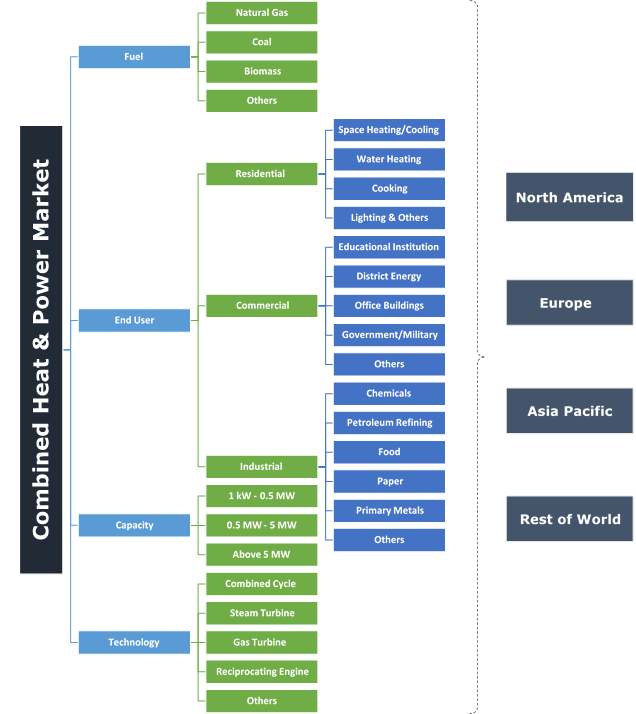 Notable players in the combined heat and power market include MAN Diesel & Turbo, ENER-G Rudox, Caterpillar, Mitsubishi, General Electric, Kawasaki, Bosch Thermotechnology, Viessmann Werke, FuelCell Energy, MWM, Cummins, Veolia, BDR Thermea, CENTRAX Gas Turbines, Wartsila, ABB, 2G Energy, Aegis Energy, Yanmar, Siemens. Manufacturers are focusing on merger and acquisition strategies to expand regional presence and gain competitive edge. In May 2016, Centrica acquired ENER-G Holdings, an established operator and supplier of CHP solution, to enhance its distributed energy offering. CHP is a clean and efficient approach to generate thermal energy and on-site electric power from a single source. Its greater efficiency compared to conventional fired power plants and lower operating cost makes its adoption preferable over other available alternatives. It can use a variety of fuels, both renewable and fossil fuel such as coal, natural gas, biomass. These systems find its wide application among residential, commercial, and industrial sector.